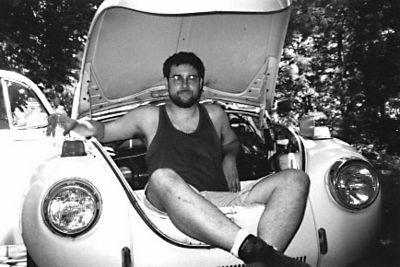 1972 VW Super Beetle in its earliest stage of tear down, summer 2000. At the time we were in a condo; no place to work! So a kindly friend from church loaned me her garage. This was not such a good thing; it was 20 minutes away, and if something isn't in my face I don't work on it. So I didn't much.